Inspired by an Egg Creative Challenge, I explained to my daughter JJ (3 years and 10 months old) that one of my ‘computer friends’ was inviting kids around the world to do something with eggs, BUT the catch is that it has to be the kid’s idea. I asked JJ what she wanted to do. 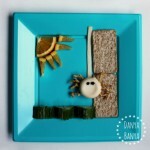 Initially JJ thought she might make make sculptures using plastic eggs, toothpicks and playdough. She had lots of fun playing with these items, and did come up with two sort-of egg people. I was encouraging, but inwardly I thought that there wasn’t the sense of process or accomplishment that this challenge calls for. 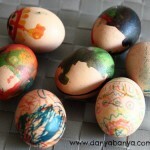 She spent more time role-playing with her egg people, rather than constructing them. I thought to myself that perhaps, at 3 years and 10 months old, she isn’t quite up for a creative challenge like this just yet. Now – don’t get me wrong, role-playing is awesome! Actually all play is awesome, which is why I didn’t redirect her back to the challenge at hand, and instead let her play. But in this instance, it does show that she doesn’t yet have the organisational skills and self-discipline to create a plan and carry it though to achieve an outcome. In her defence, I probably rushed too quickly to gather supplies and get her started, rather than helping her to formulate a clear plan in the first place. But nevermind, I put the creative challenge idea aside thinking that we could try again another time. And then a few days later, JJ asked for a chocolate Easter egg. She specifically wanted a chocolate Easter egg that is wrapped in coloured wrapping, just like a store-bought one. She knew that we didn’t have any in the cupboard (as we don’t tend to keep ‘party food’ in our house), but she asked if we could make one please. 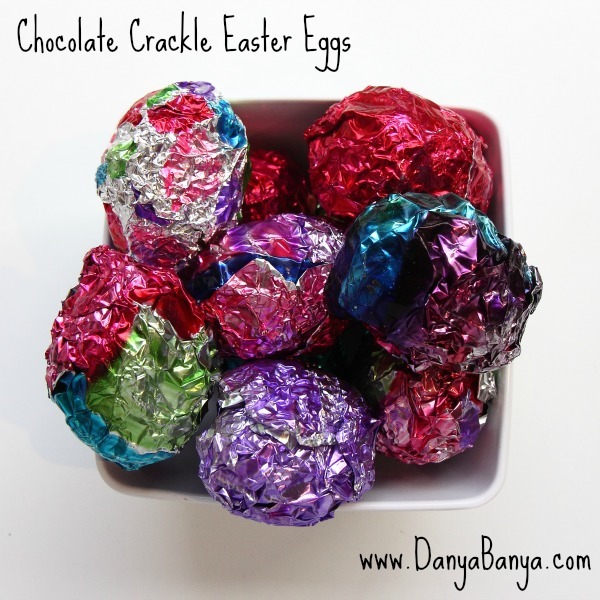 I explained that I didn’t know how to make chocolate eggs, but perhaps we could make chocolate crackles in the shape of eggs? She was adamant that they needed to be wrapped, in coloured wrappings. So I suggested that we could paint some foil. She thought this was a brilliant idea! She connected the dots between our earlier activity, and said that she wanted to make chocolate crackle Easter eggs, wrapped in coloured foil for Mummy’s “computer friends” to see. And thus we were delivered a second chance at this challenge! This time, I wanted to help JJ to plan effectively. So, I didn’t rush in and gather materials. Instead I asked her what her plan was. I asked her what steps she would need to take. I helped her develop a rough timeline. I gave her a brand new (mint-scented) notebook, and explained that this book is her special writing book, and I asked her to write out her plan. She baulked at first (probably because she is only three and doesn’t know how to write), so I wrote the heading “Chocolate Crackle Easter Eggs In Painted Foil” across the top of the first page, and gave her the pen. She took over from there. She narrated as she wrote. Her notes took up several pages. They didn’t always go top to bottom or left to right, and they certainly weren’t legible, but the outcome was the same. She had formulated and written down a firm idea. A plan. This washing step was my idea, lol. Kids don’t seem to worry about this sort of thing! We used pastel plastic eggs like these (although the hinges have all broken on ours, as we’ve been playing with them for a while. 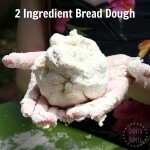 You can find our easy recipe at the bottom of this post. JJ helped to measure and weigh the quantities of the various ingredients (which is great meaningful maths practice). I melted the chocolate sauce over the stove top, and then JJ helped to mix it all together. With my help, JJ filled the first five of the moulds. I did the last five or so myself. 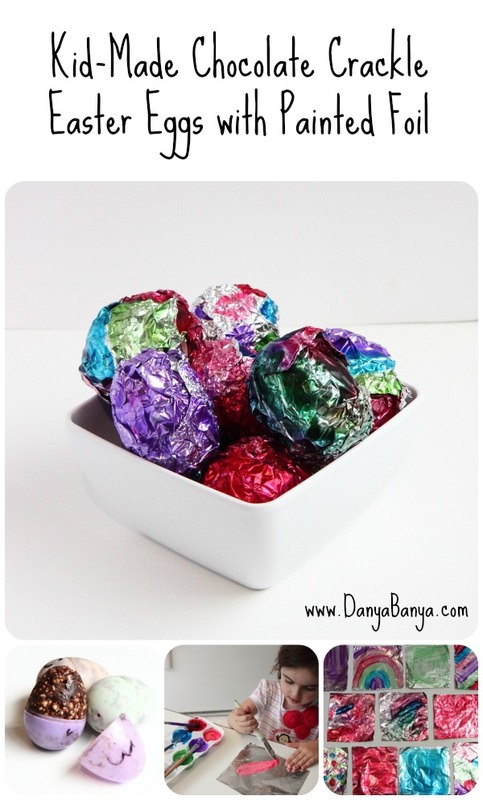 I followed this colored aluminium foil tutorial to make the foil paint (except that I used liquid watercolours for the red & purple instead of food colouring). JJ and I painted alongside each other; she much prefers creative pursuits when we do them together. She painted the middle three (below), taking a very long time to make sure that she covered every tiny part of the foil square. I painted the other eight alongside her in about the same time frame (although my efforts were much more slapdash). JJ and I had a production line going for this step. I would remove the chocolate crackle egg from the mould (which was quite tricky), and then pass it to JJ who would wrap it and then place it in a bowl. So in effect, JJ wrapped all ten eggs by herself. Didn’t she do a good job! It was so interesting to watch the difference in JJ’s attitude between the first half-hearted attempt at egg sculptures to this second full blown effort of planning and execution. I think the difference in attitude was partly because she was keen to eat the results, and partly because she felt personally invested in the process. She kept pausing and writing notes in her special writing book as we went along. As you can see by the outfit changes, this activity was done in three distinct stages over several days, and JJ was enthusiastic the entire time. So I’ll happily flip flop on my earlier statement. 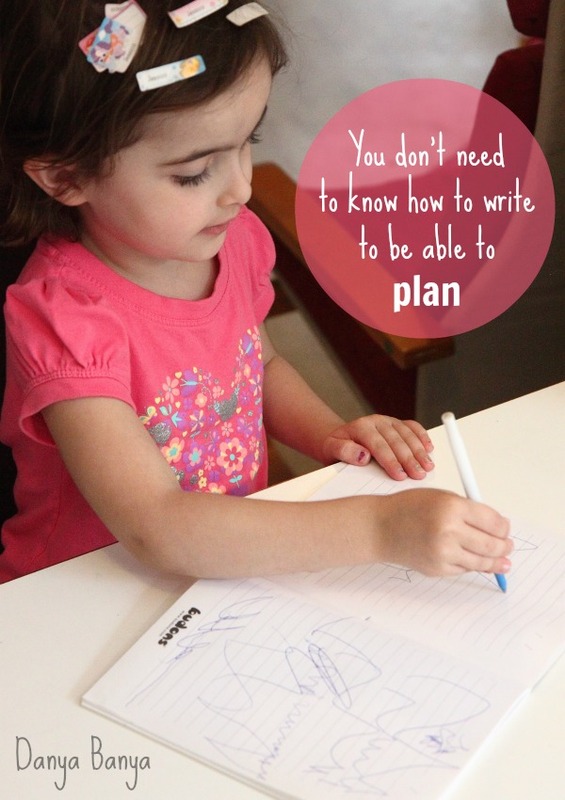 At 3 years and 10 months, JJ has shown that she does have the organisational skills and self-discipline to create a plan and carry it though to achieve an outcome. Especially if it involves chocolate. And especially if I help by not jumping in too quickly. 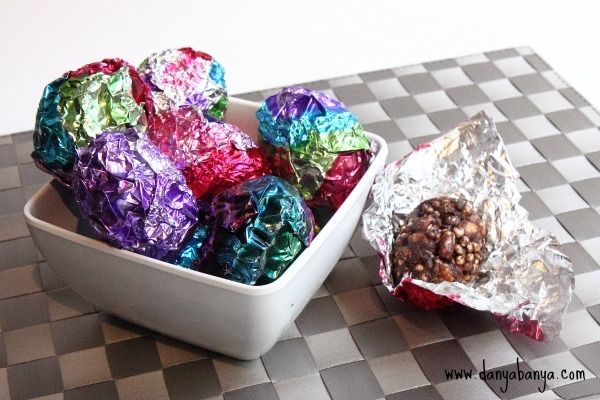 And here is the chocolate crackles recipe for anyone who wants to try these at home! (This is a slightly richer version to my previous chocolate crackles recipe). Melt the chocolate, butter and golden syrup together over a double boiler (or you can use the microwave at a low setting in short bursts). Pour over the dry ingredients and mix until combined. Scoop into moulds and put in the fridge to set. 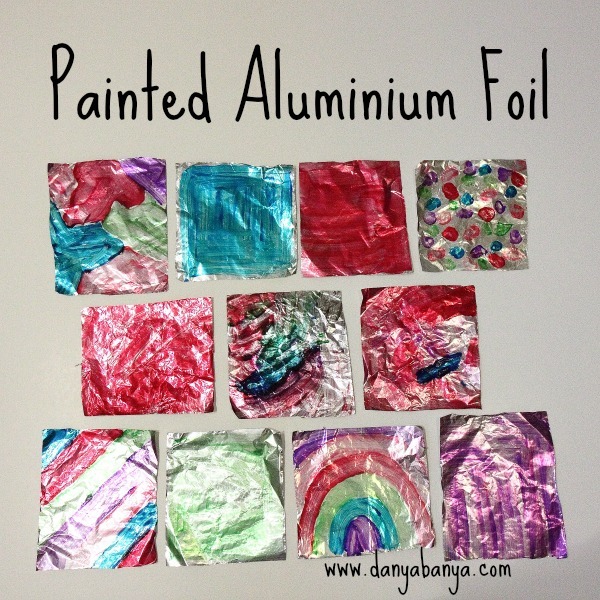 Remove from the moulds, and wrap in painted foil. Enjoy! She did a great job and this is such a wonderful idea! this is such a brilliant idea! She did a wonderful job 🙂 Happy Easter weekend! That painted foil is beautiful! She did such a lovely job! Thanks Rachel, I think so too! Thanks, and so glad she liked it! Happy Easter! You're amazing. I just love this idea! Really great idea 🙂 You've inspired me to get painting on foil as well! Keep forgetting to. Thanks! 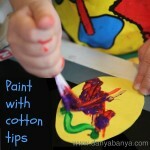 My recent post 6 Activities for kids spanning the ages. This would make a lovely party favour for a birthday party too 🙂 Great idea. So beautiful. And they look yummy too! The handmade foil is a special touch. Love. Those chocolate crackles look super yummy. What a great idea! Thanks! We gobbled up some and gave the rest to a few of JJ’s friends.